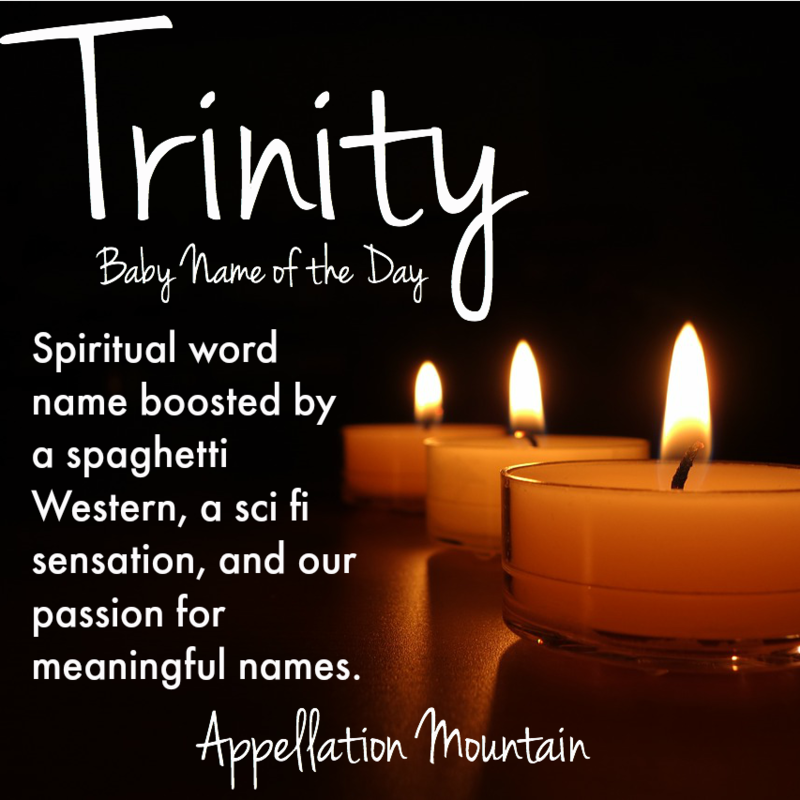 It’s a spiritual name with cowboy and sci-fi ties. 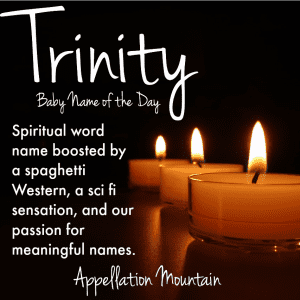 Thanks to Aurelia for suggesting Trinity as our Baby Name of the Day. Strictly speaking, a trinity is a trio. The word’s roots are Latin: trinitatem comes from trinus – triple, ultimately from tres – three. But it’s meant so much more for centuries. As an English word, trinity traces to the 1200s. The concept of the Holy Trinity – the Father, the Son, and the Holy Spirit – is older still. The Latin term was probably first used by Theophilus of Antioch in the second century. Others wrote about the idea even earlier. While virtue names have long histories, Trinity is bigger than that, a central tenet of Christian faith, much debated and explored over the millennia. Despite the weightiness of the concept, Trinity has sparing history as a given name as far back at the 1920s. Maybe that’s because Trinity fits the three-syllable, ends-in-y pattern for a girl’s name, a pattern in use from Dorothy to Kimberly to Emily to Everly. A small number of girls were given the name in the 1960s, but Trinity really made waves as in the 1970s. The Western became a big hit in the US, too. The sequel, Trinity is Still My Name, was an even bigger hit. No surprise, then, that the name charted in the US Top 1000 from 1974 through 1979 for girls, and from 1974 through 1980 for boys. Despite the cowboy cool of Hill’s character, many parents still perceived Trinity as a potential girls’ name. Maybe that’s because of 1970s favorites with a similar rhythm, like Kimberly, Tiffany, Emily, and Melanie. Trinity re-entered the girls’ Top 1000 in 1993, and climbed quickly, reaching #522 in 1998. 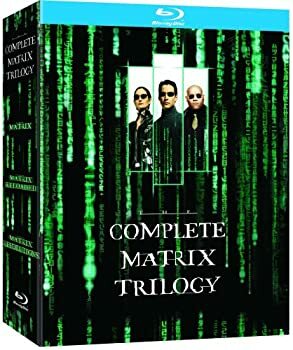 The Matrix starred Keanu Reeves as Neo, a computer programmer who discovered that the real world was actually a complex manufactured reality, designed by machines to oppress humankind. Neo becomes the leader of a rebellion. The movie was a sensation, and two sequels followed. Carrie-Anne Moss played Trinity, another hacker escaped from the manufactured world of the Matrix. She’s a love interest for Neo, but also a skilled fighter and ally. We learn that she chose Trinity as her alias when she first hacked a database, but we never learn her given name. In 1999, Trinity leapt to #209, and ranked #74 by 2000. By 2003, when the final installment in the trilogy was released, the name charted at #56. Trinity: Spiritually Significant or Too Red Pill? On the one hand, we’re all about meaning-rich names, from the more traditional virtues to bolder, modern possibilities, like Legend and Miracle. Trinity fits this pattern, with a clear nod to faith. The Matrix character is a hero, one of the characters who dares to take the red pill and see things as they really are. She’s as noble a figure as Katniss or Hermione, and it’s no surprise that she inspired parents. As of 2013, Trinity had fallen to #108. 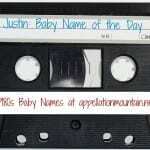 And yet, many families still like the idea of names that express their faith while feeling distinctly modern. If your shortlist also includes Nevaeh and Faith, Trinity might be another name to consider. Do you think Trinity works as a modern virtue name? As for Trinity, it’s not for me. Boy or Girl. But I can appreciate the history and sentiment. Trinity definitely works as a virtue name of sorts, but as an atheist I prefer more secular examples such as Amity, Clarity, and Verity. Also, Trailer Park Boys ruined Trinity for me. Whenever I hear it I think of, well, trailer parks. I agree — to me, Trinity feels like what people call a “stripper name”, like Candy or Crystal or Misty, etc. My friend Mari Mancusi has a YA series called SCORCHED about dragons and the heroine’s name is Trinity. Two thumbs up. I vote “yes” it works – but there a few I’d never use and it is one. It’s far too specifically Christian for my family and not a general sort of virtue/spirituality name at all. But I like similar names, and I wouldn’t mind it on someone else’s child. I love virtue names but Verity/Clarity/Felicity/Faith feel much less tied to a *specific* faith. My favourite sci-fi name of the moment is Irisa. Trinity would go well with Evangeline. Love Trinity. I’m due in a couple of weeks and still deciding between Trinity or Love as one of the middle names if we have a girl. My other two girls have Serenity and Honor as their virtue middle name. It’ll either be Anastasia Bluebell Love or Anastasia Trinity Bluebell votes welcome I’m too torn! Anastasia Trinity both have strong Christian roots – not a bad thing in my eyes but might be a hassle if that isn’t your background. I know a little anastasia and I love her name! I vote Anastasia Bluebell Love too. The rhythm is beautiful.